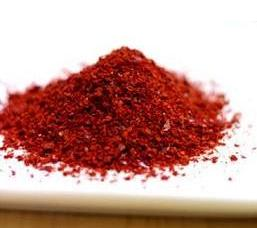 Gochugaru is red chili peppers that are dried and then grounded into a coarse or fine powder. Gochu literally means chili pepper and garu means powder in Korean. It is used extensively in Korean cooking to add spiciness & flavors and is one of the most popular ingredient found in numerous dishes. Some dishes that contains abundant amount of gochugaru are tukbokki, koatgaetang, dakdoritang, kimchi chigae, kimchi, kkakdugi, and nakji bokum just to name a few. The quality of gochugaru depends on how well chili peppers are riped and dried in natural sunlight or with heat. Naturally drying chili peppers under sunlight is considered best, resulting in vibrant red colored chili peppers that transforms into spicier taste. Also, the purer the chili powder, the spicier it is and with a proper amount, it will make any dishes savory and can arouse more appetite. Nowadays, most Koreans buy packaged gochugaru instead of making their own as it can take great amount of time and care to produce from scratch. As it is important in any type of cooking, it's essential to shop for basic ingredients that are premium in quality, but yet reasonably priced which can make the difference in its overall taste.